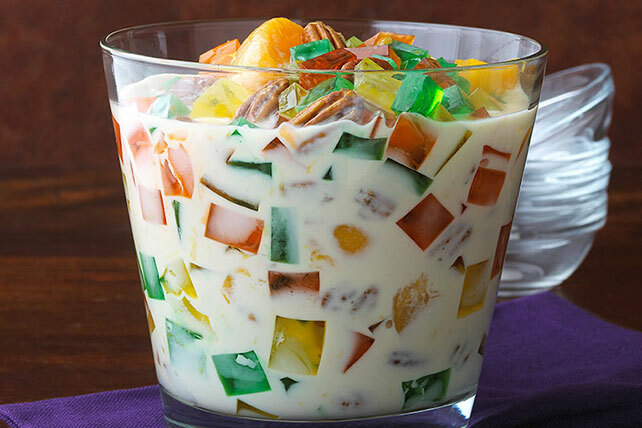 This ambrosia-style dessert substitutes fun, fruity gelatin cubes for the traditional fruit. Add 1 cup boiling water to each flavor of gelatin mix in separate bowls; stir 2 min. until completely dissolved. Pour each flavor into separate 8-inch square pan. Refrigerate 1 hour or until firm. Meanwhile, mix evaporated milk, condensed milk, peaches and lemon zest; refrigerate until ready to use. Cut gelatin into 1/2-inch cubes; place in medium bowl. Add milk mixture and nuts; mix lightly. Use 1 pkg. (3 oz.) JELL-O SIMPLY GOOD Orange Tangerine Flavor Gelatin. Stir in 1/2 cup toasted BAKER'S ANGEL FLAKE Coconut along with the milk mixture and nuts. Gelatin cubes can be mixed with milk mixture and nuts ahead of time. Refrigerate up to 4 hours, until ready to serve. If desired, gelatin mixtures can be prepared up to 24 hours ahead. Then cut and assemble within 4 hours of serving. Garnish dessert with a few PLANTERS Pecan Halves just before serving.